Preheat the oven to 350°F. Place the oil in a 10" cast iron skillet and place it in the oven to preheat while you work. 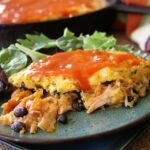 In a small bowl, mix the shredded chicken with 1/2 cup of the enchilada sauce and set aside. In a large bowl, mix the cornmeal, salt, milk, eggs, green chilies, and cream style corn together until just combined. Carefully remove the hot skillet from the oven and set it on a heatproof surface. Carefully pour about half of the cornbread mixture into the pan. Gently sprinkle the chicken over the mixture. Sprinkle the black beans over the chicken. Sprinkle the cheese over the black beans. Pour the remaining half of batter over the top and spread evenly. Return to the oven for 50 to 60 minutes or until golden brown and cooked through. Remove from the oven and pour the remaining enchilada sauce over the top. Serve warm.